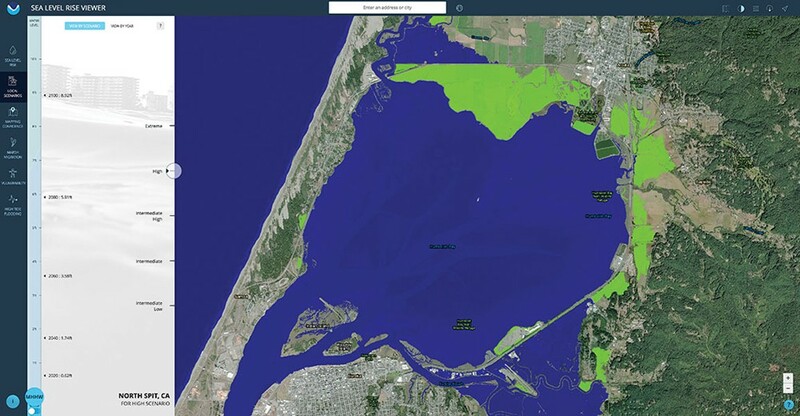 coast.noaa.gov A scenario for Humboldt Bay from NOAA's interactive Sea Level Rise Viewer. Complicating matters, no one agency is responsible for maintaining the dikes. There are 170 different landowners and the failure of even one to maintain their portion of the "bathtub" would result in everybody getting inundated. Scientific predictions about sea level rise stretch decades into the future but it can take decades to get funding and build mammoth projects. So prudent agencies — in particular the county and the cities of Arcata and Eureka — are beginning to develop plans and policies to keep Humboldt safe and dry as the ocean rises. The county is in the process of updating its Humboldt Bay Area Plan and wants to change some of its own internal policies to make people more aware of the realities of sea level rise. When a person buys property, the buyer must be informed before escrow closes of any existing problems that may not be obvious at the time of purchase, such as a leaky roof or nuisance neighbors. One proposal is that a property's location within a sea level rise zone could be added to this list of required notifications. Some jurisdictions are also considering changes in code language that would restrict the kind of improvements property owners in these zones could make. Or the buyer might have to sign an agreement saying that the city or county is not responsible if access gets cut off because of rising waters. Naturally, some people are worried about the immediate decline of property values that could result from such disclosures. Others are worried about the effect it would have on their home insurance policies. Still others wonder if their property taxes will rise or fall, depending on what proactive solutions the county or cities take — or fail to take. Another more drastic solution being considered is moving entire communities to higher land. At a workshop held last year by the Humboldt County Planning Department in the seaside community of Fairhaven, planners said that the greatest danger to the community was not from ocean waves but the rise of groundwater that would be pushed upward by intruding saltwater. They noted that the entire community could be relocated to a location further inland. Of course, then the question arises as to who will pay for these expenses. The county, along with other agencies, is considering forming a joint power agency to repair and restore the failing dikes. 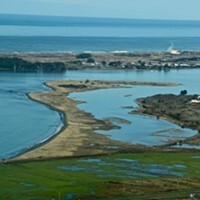 Previously, an inter-agency group, called the Humboldt Bay Sea Level Rise Working Group, met for several years to study these problems before its funding ran out. However, one major problem is emerging and it is not caused by nature but by bureaucratic conflict. Major manmade alterations to the shoreline are not permitted by the California Coastal Commission. Created by the California Coastal Act in 1972, the commission's main focus up to now has been protecting the coastline from development. So the commission has a built-in bias against manmade structures, such as dikes and levees, particularly if they impact existing wetlands. When tidelands were first diked off from the sea to create pastures, they were at sea level. But in the decades that have passed, they have sunken and are now lower than the open water on the seaside of the dikes. It would be very difficult to drain these lands if they got flooded by seawater. However, this dire scenario could be prevented under one proposed solution by placing dredge spoils on these lands, raising their elevation, improving their drainage, and making them less vulnerable to wave overtopping. Most of these former tidelands also serve as freshwater wetlands during the rainy winter months. "Wetland fill is not allowed by the coastal commission for a sea level rise adaptation strategy," commented Shikany at a Jan. 10 presentation to the Humboldt County Planning Commission. Nonetheless, the Coastal Act, which is the charter for the Coastal Commission, does encourage the preservation of both agricultural land and wetlands, and it is painfully clear that both will be lost if the county does nothing to preserve them. Therefore, county planners are hopeful they can present a convincing argument to the Coastal Commission — which has given grant money to the county to study these problems — that they should make an exception to their rules. Bob Merrill, district manager of the North Coast District of the Coastal Commission, is confident that compromises can be found. "We have a good relationship with the county planning department. We meet often with them, and we gave them some grant money to study these problems," he told the Journal. He pointed out that repairing dikes, as opposed to enlarging them, is already perfectly legal under the Coastal Act. Repairing or enlarging dikes, however, will not solve the issue of rising groundwater, and both are very expensive undertakings. Some communities may have to choose between protecting critical infrastructure, such as sewage treatment plants, and saving all agricultural lands. Bigger and better dikes, however, are not the only way to keep the ocean at bay. Aldaron Laird, an environmental planner who has studied Humboldt Bay extensively in recent years, has come up with some more environmentally friendly alternatives that Shikany indicated may prove workable. "A living shoreline is a protected, stabilized coastal edge that employs the strategic placement of natural materials, such as plants, sand, shellfish or rock, sometimes in combination with harder shoreline structures that stabilize estuarine coastlines, bays and tributaries by creating an environmentally friendly buffer that protects coastlines from erosion and wave energy," said Shikany. Unlike hard structures, living shorelines grow over time and help the environment in other ways by improving water quality, increasing oxygen levels in the water, reducing erosion, storing carbon and providing habitat for wildlife. Living shorelines perform better during major storms and cost less than "hard" shorelines, Shikany said. The East Coast has been the leader in developing this method of protecting its shores. There are many ways of creating living shorelines. Some begin with berms of cobbled rocks that disperse the energy of waves. They can be used on open shorelines, in the quieter waters of sheltered areas or at the base of existing dikes, all of which would protect shores against erosion. Marsh sills are another natural means of protecting shorelines. They are low walls of rock fragments, placed in the water parallel to existing shorelines. Sand and sediment accumulate between the sill and shoreline, and the area becomes vegetated. Wave action impacts the sill rather than the original shoreline. Tidal benches are gently sloping "dissipative benches" made of salt marsh and mud flat. They dissipate wave energy, provide good intertidal habitat, stabilize shorelines and create good resting places for migratory birds along the Pacific flyway. They work well in combination with sills. Reefs can also be made out of oyster shells and living oysters. They encourage the growth of other plants and animals, and can adapt well to rising sea levels. Since October, county planning commissioners have listened to several presentations on these topics but have yet to come to any definitive solutions. These presentations have come at the end of long planning commission sessions dedicated to other business and have not received much public attention. The purpose seems to be to give the commissioners time to study the issues and debate policy. Shikany says that a future workshop on sea level rise will be held specifically for the general public and that it will be widely publicized beforehand. She pointed out that two workshops held last year in Fairhaven and King Salmon were well attended. When the Planning Commission settles on its policy recommendations, they will be presented to the Humboldt County Board of Supervisors as part of an update to the county's Local Coastal Plan. This will, in turn, be presented to the Coastal Commission for approval. Elaine Weinreb is a freelance journalist. She tries to re-pay the state of California for giving her a degree in environmental studies and planning (Sonoma State University) at a time when tuition was still affordable.